The idea that we can climb up to heaven to see God in all His glory is very attractive. It has so enveloped some people that they actually gave up their “normal lives” to live in communes of one sort or another. This was so they could pursue direct, unencumbered communion with the Almighty. Adherents to this purpose developed what was called the “monk’s ladder” (From Guigo II, Scala Claustralium in Latin). It included four rungs: 1. reading Scripture, 2. Meditating on the Scripture to find the hidden meaning (seeing all scripture as analogy; an error), 3. Prayer as response, and 4. Quiet contemplative living. 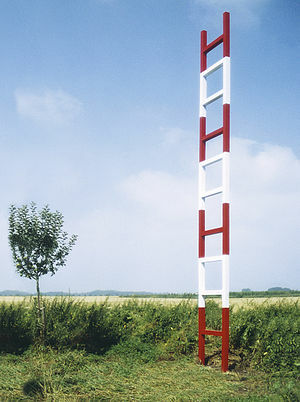 Others have developed ladders based not in a personal encounter with the Almighty, but on the personal effort of satisfying God’s moral demands. Their ladder is a morality that was derived from Scripture and other sources, including socio-cultural norms. Scripture is useful for becoming more like God. Finally, the last group has developed a ladder that satisfies the mind and fills in the gaps of understanding that Scripture presents. These people have developed a ladder based on speculation. Disatisfied with the tensions of Scripture, they attempt to resolve these tensions through logical reasoning. For the most part, they, like the other mentioned earlier are recipients of Platonic thought. Their error is that they don’t take God at His word, but need to justify God’s words. They climb the ladder of an intellectual form of Christianity that doesn’t need to wrestle with the self. Instead of facing the crucifixion, they narrowly avoid it by rationalism. All of these have inherited the disease of the tower builders in Genesis 11. We all believe that we can reach God(hood) if we have the right method. Only one problem: it’s idolatry of the self. Into Babel, God brought the judgment of dividing people based on language. Into our idolatry, he brings the curse of death. And , in fact, these ladders are a proof that we are dead. We need someone to descend into our burial hole to rescue us from the death we are in. 51 He then added, “Very truly I tell you, youwill see ‘heaven open, and the angels of God ascending and descending on’ the Son of Man.” Jesus, alone, is the Ladder who has come out of heaven and brought heaven down to earth.